NOW THAT THE ORDER FOR CIVILIAN EMPLOYEES ARE OUT, WE SHALL WAIT FOR THE MINISTRY OF DEFENCE ORDERS AND THEN THE PCDA CIRCULAR GIVING DETAILS OF ESM PENSION TABLES ETC. YOU CAN TAKE HAVE A LOOK AND HAVE CLUE AS TO HOW CIVIL PENSIONS ARE FIXED AS PER 1ST FORMALA OF INCREMENTAL METHOD. NO GUESSES PL. WHILE IT MAY TAKE A MONTH OR SO, IF NOT MORE, LET US WAIT. Sub:- Implementation of Govt’s decision on recommendations of the Seventh Central Pay Commission - Revision of pension of pre-2016 pensioners/family pensioners, etc. The undersigned is directed to say that the 7th Central Pay Commission,in its Report, recommended two formulations for revision of pension of pre-2016 pensioners. A Resolution No. 38/37/2016-P&PW (A) dated 04.08.2016 was issued by this Department indicating the decisions taken by the Government on the various recommendations of the 7th CPC on pensionary matters. 2. Based on the decisions taken by the Govt on the recommendations of the 7th CPC, orders for revision of pension of pre-2016 pensioners/family pensioners in accordance with second Formulation were issued vide this Department’s OM No. 38/37/2016-P&PW (A) (ii) dated 04.08.2016. It was provided in this OM. that the revised pension/famiiy pension wet. 112016 of pre-2016 pensioners/ family pensioners shall be determined by multiplying pension/family pension as had been fixed at the time of implementation of the recommendations of the 6th CPC, by 2.57. 4. The aforesaid Committee has submitted its Report and the recommendations made by the Committee have been considered by the Govt. Accordingly, it has been decided that revised pension/family pension w.e.f 01.01.2016 in respect of all Central civil pensioners/family pensioners, including CAPF’s, who retired/died prior to 01.01.2016, may be revised by notionally fixing their pay in the pay matrix recommended by the 7th CPC in the level corresponding to the pay in the pay scale/pay band and grade pay at which they retired/died. This will be done by notional pay fixation under each intervening Pay Commission based on the Formula for revision of pay. White fixing pay on notional basis, the pay fixation formulae approved by the Government and other relevant instructions on the subject in force at the relevant time shall be strictly followed. 50% of the notional pay as on 01.01.2016 shall be the revised pension and 30% of this notional pay shall be the revised family pension wet. 1.1.2016 as per the first Permutation. In the case of family pensioners who were entitled to family pension at enhanced rate, the revised family pension shall be 50% of the notional pay as on 01.01.2016 and shall be payable till the period up to which family pension at enhanced rate is admissible as per rules. The amount of revised pension/family pension so arrived at shall be rounded off to next higher rupee. 5. It has also been decided that higher of the two Formulations is the pension/family pension already revised in accordance with this Dept’s OM No. 38/37/2016-P&PW(A) (ii) d/d 04.08.2016 or the revised pension/ family pension as worked out in accordance with para 4 above, shall be granted to pre-2016 central civil pensioners as revised pension/family pension w.e.f. 01.01.2016. In cases where pension/family pension being paid w.e.f. 1.1.2016 in accordance with this Department’s OM No. 38/37/2016~P&PW(A) (ii) dated 04.08.2016 happens to be more than pension/family pension as worked out in accordance with para 4 above, the pension/family pension already being paid shall be treated as revised pension/family pension w.e.f. 1.1.2016. 6. Instructions were issued vide this Department’s OM No. 45/86/97-P&PW(A) (iii) dated 10.02.1998 for revision of pension! family pension in respect of Government servants who retired or died before 01.01.1986, by notional fixation of their pay in the scale of pay introduced with effect from 01.01.1986. The notional pay so worked out as on 01.01.1986 was treated as average emoluments/last pay for the purpose of calculation of notional pension/ family pension as on 01.01.1986. 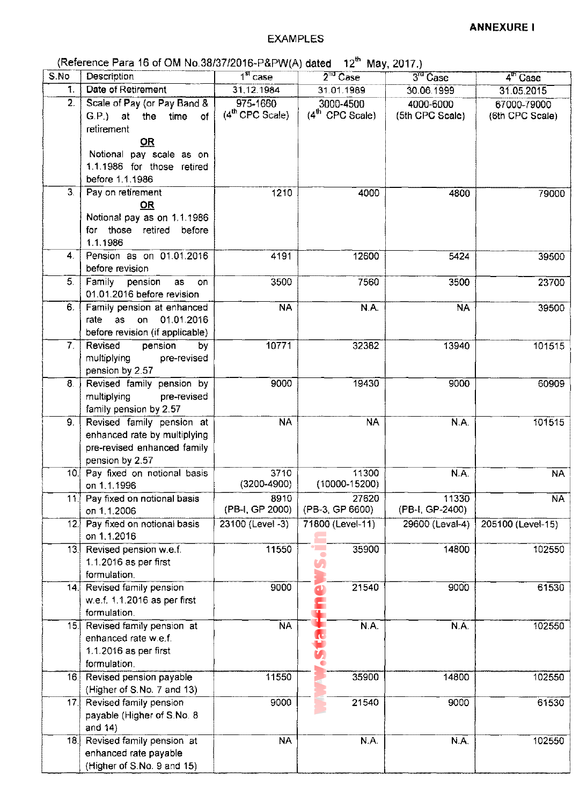 The notional pension/family pension so arrived at was further revised with effect from 01.01.1996 and was paid in accordance with the instructions issued for revision of pension/family pension of pre-1996 pensioners/family pensioners in implementation of the recommendations of the 5th Central Pay Commission. 8. The minimum pension with effect from 01.01.2016 will be Rs. 9000/- per month (excluding the element of additional pension to old pensioners). The upper ceiling on pension/family pension will be 50% and 30°16 respectively of the highest pay in the Government (The highest pay in the Government is Rs. 250,000 with effect from 01.01.2016). 12. The pension of the pensioners who are drawing monthly pension from the Govt on permanent absorption in public sector undertakings/autonomous bodies will also be revised in accordance with these orders. However, separate orders will be issued for revision of pension of those pensioners who had earlier drawn one time lump sum terminal benefits on absorption in public sector undertakings, etc. and are drawing one-third restored pension as per the instructions issued by this Department from time to time. The amount of additional pension will be shown distinctly in pension payment order. For example, in case where a pensioner is more than 80 years of age and his/her revised pension is Rs.10,000 pm, the pension will be shown as (i) Basic pension = Rs.10,000 and (ii) Additional pension = Rs.2,000 pm. The pension on his/her attaining the age of 85 years will be shown as (i).Basic Pension = Rs.10,000 and (ii) additional pension = Rs.3,000 pm. Dearness relief will be admissible on the additional pension available to the old pensioners also. Defence we are habitual to work is first and welfare is last.